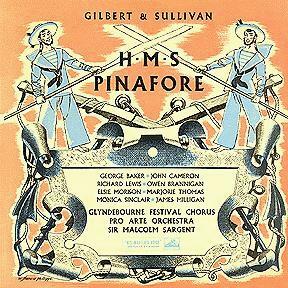 This was Sir Malcolm Sargent's fourth G&S recording with grand opera singers, the Pro Arte Orchestra and the Glyndebourne Festival Chorus. It was the first of the series to include George Baker, who replaced Geraint Evans as patter baritone after the latter declined to participate in any more G&S recordings. Baker's G&S gramophone career goes back to some of the earliest G&S recordings that were ever made. Even after HMV abandoned its policy of favoring house singers over D'Oyly Carte's, Baker found a place in nearly every 78rpm set, because of his excellent diction. By the time this series of recordings was made, Baker was in his mid-seventies and long past his prime. Nevertheless, his great artistry shines through. If the voice is not the pure gold it once was, the interpretation is still a charming one, bubbling with personality. 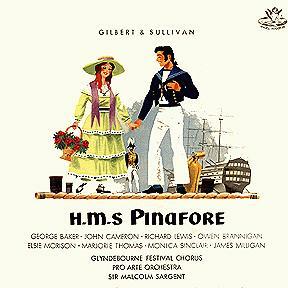 This was Baker's second recording of Pinafore. 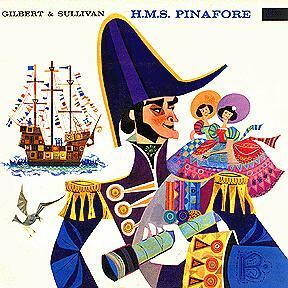 He also played the Captain on the 1930 recording. As on all the Sargent sets, the singing is first-rate, but at times it seems a bit too precious, especially the chorus. Sargent's tendency to take things too slowly is less pronounced here than on some other sets, but most of the numbers seem a shade under-paced. The performance does seem to catch fire a bit starting with the Bell Trio in Act II. You could do a lot worse, but with the 1960 D'Oyly Carte recording readily available, this cannot be anyone's first choice. 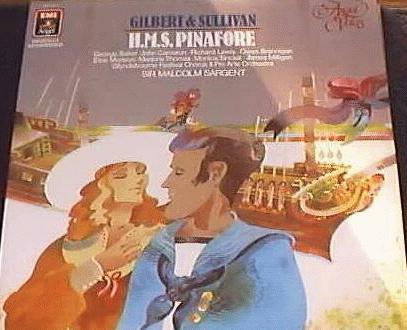 This set was originally issued on LP and, like all the Sargent recordings, remained available until LPs became obsolete. 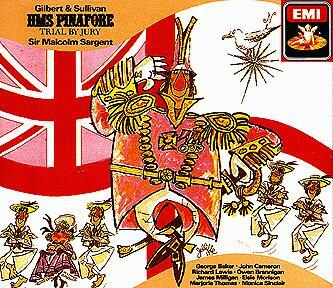 It was then digitally-remastered and re-issued on CD in 1989. EX7 49594-1 Also includes Yeomen.